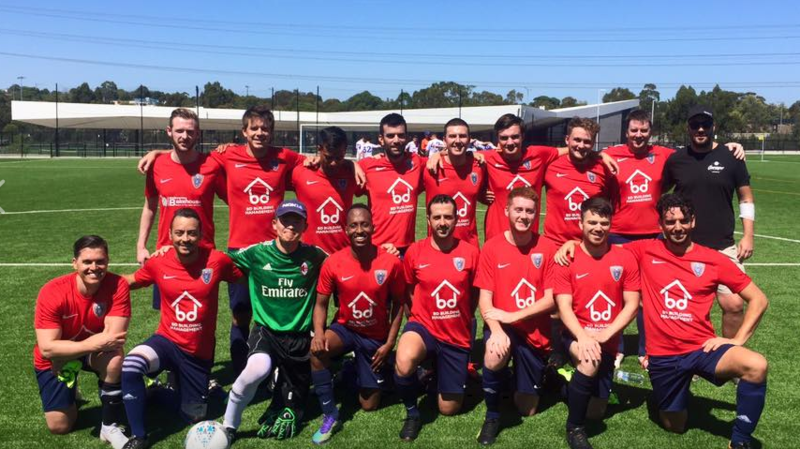 Riversdale SC proved to strong for the Parker’s in Round 1 of the FFA Cup winning 3-0 at St Kevin’s Sports Fields on Saturday afternoon. The State League 4 side controlled the midfield for most of the first half but it took nearly the full 45 minutes for Riversdale to crack Albert Park’s defense. It was a well worked set piece that curled in towards goal and only needed a glancing header from their striker to turn it into the net. Albert Park went into the change rooms at half time with mixed emotions as they felt as though they were out maneuvered yet trailing by only a goal left the side with plenty of hope for another upset in the second half. Coach Gravy employed a change in formation and a change in the midfield personnel to try and upset the Riversdale’s rhythm. It appeared to be working early on with time on the ball and in the opposition half being more evenly poised in the early stages. Adam (Bubba) Byrne nearly leveled the game for the Parkers when he received the ball forward of the left wing around the 70 minute mark. Bubba opted to test their defense by striding toward goal and adding a shimmy and a shake before firing a firmly struck far post curling shot. Riversdale’s Keeper was unfortunately up to the task producing a top class save and flicking the ball just past the far post. After the game Bubba was heard cursing in the shower saying “The Keeper didn’t even see the F*&%ing thing, don’t know how he saved it”. It was the closest the Parkers had come to goal all game and despite their endeavor, Riversdale managed to ice the game by slotting two more goals in quick succession soon after. When asked what the difference was on the day Coach Gravy commented that “they defended really well and didn’t give us much. We used pace and long balls but they manage to deal with it all. Above all, I came away being pretty happy this early in the season. The FFA Cup Pre-Game Friendly between Albert Park and Riversdale had plenty of quality and talent on display. Paul Cartwright opened the account for the Parkers 20 minutes into the game when he made a perfectly timed run in behind the right fullback, got on the end of a perfectly weighted pass and finished superbly with the inside of the foot into the top corner of the net. From this moment on, the Parkers appeared to dominate the first half with very little clear cut opportunities being let through a very formidable defense led by Ash Moore and Thomas Picard. Alessio Zungri looked in a class of his own showcasing accurate passing coupled with numerous dribbles around players. With Albert Park dominting possession and time in the opposition half, it was only a matter of time before Riversdale conceded another goal. strangely though it came from a Riversdale defender who turned an own goal in. To cap off a wonderful team performance, a cracking free kick from Aaron Goodwin increased the Parkers lead to 3 and sealed the game…rumor has it he dubbed himself “Better than Beckham” after the game. Albert Park showed that they will possess great squad depth this year with several players demonstrating sublime skill, touch, passing and finishing. It was a side that showed great chemistry despite most players never having played with one another. It was a testament to their adaptability and attitude on the day.